ATÖLYE is an incredibly broad and ambitious project, what does it hope to bring to Istanbul? Istanbul is a city with huge potential in its making scene, cultural heritage and educated, open-minded, young generation. The city is rich with history and crafts. However we are still having a hard time catching up with global dynamics. Creative people are facing obstacles to finding the correct information, the right people to collaborate with, funding and resources on the way to bringing their ideas to life. Meanwhile, individuals who can’t find the right work environment, start working in non-creative jobs. ATÖLYE Istanbul was created as an answer to all of these problems. Our 700m2 space is an interaction and creativity platform which brings together technology, design and entrepreneurship. 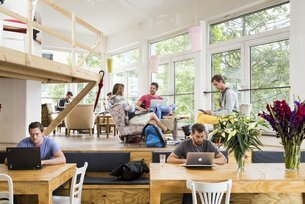 Our aim is to gather co-working, co-making and innovation under one roof. We designed a co-working space suitable for interdisciplinary crowd to experiment together, brainstorm, and build new ideas. In the common spaces of ATÖLYE we experiment, make models, test on each other and get instant feedback. We offer full-time or part-time memberships as well as design and innovation education programs for companies and individuals who are interested in improving themselves. I hear you have a beautiful building. Could you tell me about story of the space, and how it was transformed? We are in Bomontiada, in the Old Bomonti Beer Factory, Turkey's first beer factory and one of the oldest industrial buildings in Istanbul. It was built by Swiss Bomonti brothers in 1890 and gave the neighbourhood its name. We believe we took over an important heritage. In this important industrial building we want to create an ecosystem of making and support the maker culture of the city. You say your cohort is “curated”; what do you look for a business or individuals looking to join ATÖLYE? A productive and vibrant community is what is most important to us at ATÖLYE. We believe a diverse community is a healthy community: one which has international members, a broad variety of perspectives and disciplines, a healthy balance of genders. Our members are designers, programmers, engineers, business developers, creators of all kinds; ATÖLYE is a truly interdisciplinary place. Everyone is welcome, and we try to find a way to collaborate with each person who expresses an interest in joining ATÖLYE - but we do look for people who will most benefit from the amenities offered here. How do you fit into the team at ATÖLYE? Could you tell us about your background and current role? I am a product designer, born in Istanbul. After my BA, I moved to London for my Master’s at the Royal College of Art. And when I finished my studies, I moved back to Istanbul to open my own studio! Soon after I moved back I met with ATÖLYE and loved the concept. We began collaborating and now I have been working with them as a part-time designer for two years. We've worked on many projects including furniture, interiors and product design. Recently I became a co-worker in the space and, as well as managing my own studio, I am also the librarian of Maker Library Istanbul which is hosted by ATÖLYE. So, for those who don’t know, the Maker Library Network is an international community of spaces facilitated by the Brititsh Council. Could you explain a bit what goes on in your Maker Library? How does the Maker Library concept fit in with ATÖLYE’s beliefs? Well, the Maker Library encourages people to make, and ATÖLYE encourages people to collaborate - so we’re a great fit! The Maker Library is a great addition to our space because the books are especially chosen to provide readers with a starting point and inspiration for projects that they can make or build themselves. As librarian, I curate events and workshops to foster creatives and encourage learning through making. We are running a dynamic programme of activities and workshops to create an interaction point and network for makers and potential makers in the city and beyond. What are the future ambitions for ATÖLYE? ATÖLYE Istanbul has a wide network that is interested in both new technologies and traditional crafts. I believe new combinations of these two strands of knowledge will take us on some interesting journeys. We are planning new workshop sessions that bring together engineers, designers, makers and crafts-people; we have a project where we are mapping manufacturers and craftsmen in the city, with the aim of creating an open source online platform of resources. We have lots of plans to bring creative people from different disciplines together and give them a platform to make, create, and collaborate. How does ATÖLYE fit into the creative landscape of Istanbul? Are there other spaces and organisations you would like to shout about? There are loads of great organisations we are close to and work alongside; Iskele47 is a hacker space in Istanbul, Stage-Co is activating the start-up seen, Garaj-Boğaziçi has amazing grassroots hardware software community and Impact Hub Istanbul is a new social entrepreneurship project. At ATÖLYE we are open to all new ideas, we will support and collaborate with new organisms and creative groups to co-create a powerful creative scene in Istanbul.